French Onion Soup couldn't be easier to make. The only prep work is slicing some onions and pouring in various liquids. It is a great quick dinner during the week, but also makes a very elegant first course for a dinner party. This soup freezes nicely. I like to freeze it in individual bowls, then reheat it with French Dip Sandwiches for a very quick dinner. Begin by cooking the onions in the butter in a deep pot on medium heat until they begin to caramelize and turn brown in color. Stir them continuously while they cook to avoid burning. It should take 10 minutes to caramelize the onions. Add beef broth, wine, bay leaves, thyme, salt and sugar. Bring to a simmer and heat for at least 15 minutes. Lower heat. To serve, ladle soup into an oven proof bowl. Top it with a slice of crusty bread and provolone cheese. Place under the broiler for 1-2 minutes until the cheese becomes bubbly. I recommend serving it with a French Dip Sandwich. Here is the recipe! Yum!! I want to make both of these recipes!! Great looking post. French Onion Soup is my youngest son's favorite which I find so funny. 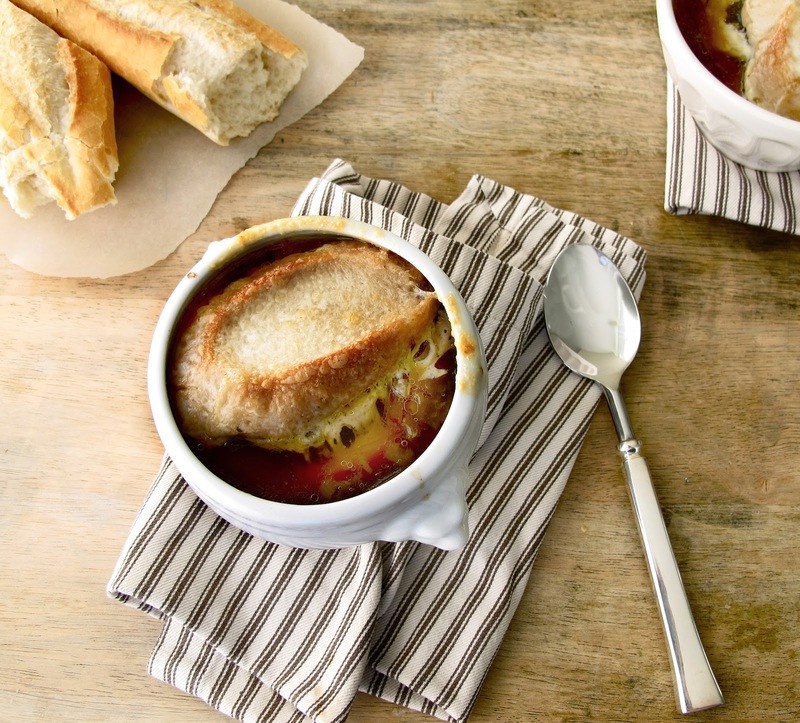 This is a beautiful photo of your french onion soup. I noticed it on Tastespotting. It looks so delicious! Thanks for the recipe! I made it tonight with the french dip and it was delicious :) Looking forward to trying out some of your other recipes. I found your website through Pinterest. I made this recipe tonight and my husband and I thoroughly enjoyed it. I'm looking forward to exploring your recipes and trying many more. Thank you, thank you, thank you! Made this last night. We loved it! Simple to make and delicious. Thanks! This soup is really tasty and looks elegant.